we woke up to find six inches of snow on saturday morning. before we even contemplated bundling up and shoveling, we made a batch of pancakes to start our morning. priorities. 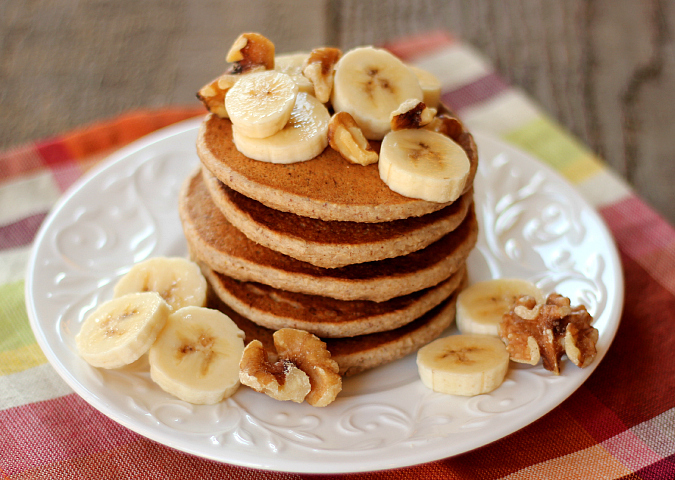 we absolutely love banana bread with nuts, and these pancakes taste just like classic banana bread. they are insanely good! 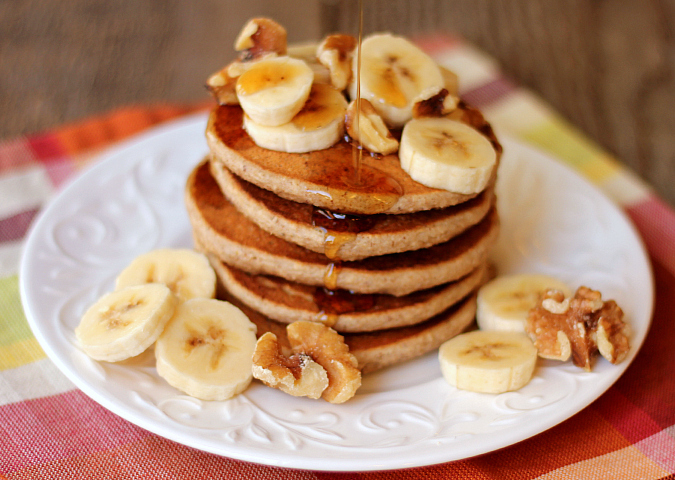 not only do they taste great, these are some healthy pancakes too! they are dairy free, egg free, oil free, sugar free, and gluten free. what's left to put in them? lots of good stuff! oats, walnuts, and pecans are ground into a flour to act as the base of these pancakes. that's combined with ground flax seed meal, baking powder, and a pinch of salt. then there's almond milk and vanilla. they get a great flavor from cinnamon and pumpkin pie spice, and of course we can't forget the star of these pancakes: the banana. we were so pleasantly surprised by how delicious these pancakes were. especially without any dairy, eggs, oil, sugar, or gluten. they take a little bit longer to cook than traditional pancakes, but they are very much worth the wait. grab a fork and dig in! in a food processor, grind the oats into a fine flour. once they are ground, set the oat flour aside and grind the nuts into a flour. add the oat flour back into the food processor along with the baking powder, flax seed meal, spices, salt, almond milk, vanilla, and banana. puree the mixture until smooth and all of the ingredients are fully incorporated. heat a lightly buttered griddle or frying pan on medium heat. pour 3 tablespoons of batter onto the griddle for medium pancakes. cook for 5-6 minutes, until small bubbles begin to form. flip the pancakes when they start to bubble, then cook for 5-6 minutes, until they are golden brown and cooked throughout. once cooked, transfer the pancakes to a baking sheet and place in a preheated 200 degree F oven to keep warm while you cook the remaining pancake batter. 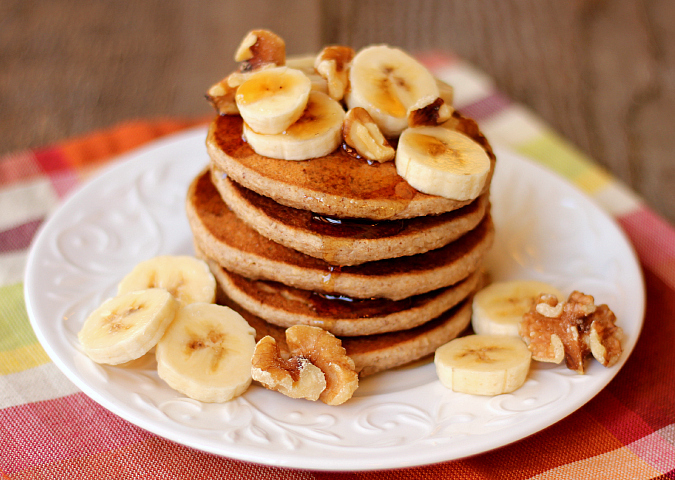 serve warm with sliced bananas, walnuts, and warm maple syrup. They sound pretty good. I like the presentation with the bananas and the walnuts on top.